The Honeyberry Plant (also known as Lonicera caerulea) is a lesser-known berry which originates from Russia and is a member of the Honeysuckle family. At James McIntyre & Sons we offer delicious Honeyberry Plants in 3 Litre containers which are well suited to UK climates, being incredibly hardy and resistant to colder temperatures. The dark blue, bell-shaped berry naturally have very thin skin and a unique flavour, with varieties tasting similar to cherries, grapes or blackberries. Honeyberries are naturally packed with antioxidants such as Vitamin C. When tested against other Superfruits such as Blueberries, Blackcurrants & Blackberries, the Honeyberry was shown to have the highest level of antioxidants, and are said to be good as an anti-inflammatory, good for your eyesight & can also have cardiovascular benefits. The berries can be eaten fresh straight from the plants, or used for other culinary purposes such as in preserves, cakes or even dried as healthy snacks. A Honeyberry Plant can have a lifespan of up to 50 years due to their hardy nature and usually ripen in late-spring or early-summer. Two plants are necessary for pollination purposes which is why we grow two different varieties in one pot to create a single self-pollinating plant. Honeyberries will grow well in most soils but loose & free-draining soil. 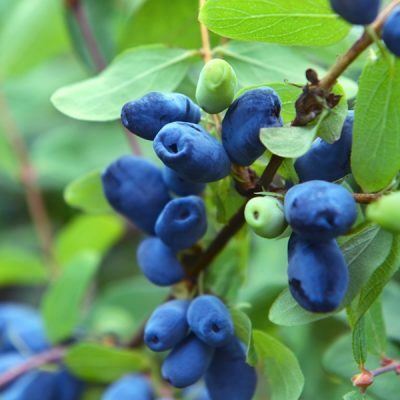 They do not mind acidic or alkaline soil which makes them a great alternative for people who struggle to grow blueberries. Ideally, plant in spring when there is no risk of frost, this allows the plant to get established over the following summer. Plant on a site in full sun to help increase fruit yield as the sun will ripen the wood. Plant 1.5m (5ft) – 2m (7ft) apart, in rows 4ft (14ft) apart. Dig a hole approx 50cm deep & wide, line the bottom of the hole with fresh compost or well-rotted manure. If using manure, also ensure it is well mixed in with the soil. Replace the soil by gently treading it back in and it is a good idea to apply a general purpose fertiliser mixed in with the soil at this time, ensuring the plants get the best possible start. Water in well. Remove straggly weak and damaged growth. new strong shoots to replace the old. Also, remove the tips of young shoots as this encourages more flowering laterals. A yearly application of a balanced fertilizer such as blood, fish and bone in the spring is all they need. Too much feed will produce lots of lush green growth and not many flowers and fruit. A mulch of well-composted organic matter will help retain moisture and improve soil conditions. It may be worth considering pollination by hand to increase the yield of fruit. They flower late winter to very early spring when there is little pollinating insect activity. Hand pollination can be done by lightly brushing over the flowers with a small, soft paintbrush.